Add another cameo to Audi’s Hollywood reel. When the sci-fi film “Ender’s Game” opens nationwide Friday, audiences will see stars like Harrison Ford, Violet Davis and Abigail Breslin act alongside the titular character played by Asa Butterfield. If they look carefully, they’ll also see a futuristic Audi “fleet shuttle quattro” make a few cameos. 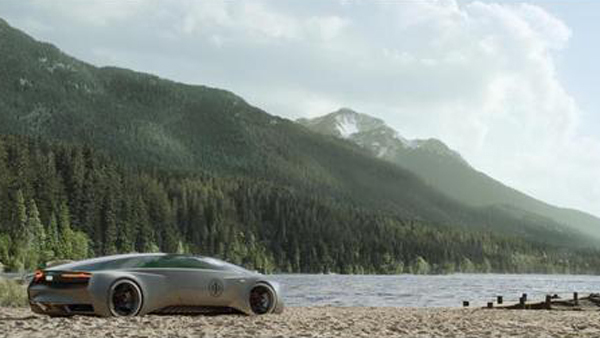 The car, which exists only in the digital realm, was designed for the film by Audi’s own in-house design team, led by Frank Rimili, Audi’s exterior design manager. Being able to design a fictional car from scratch was a thrill for someone used to the constraints of the real world. Though the initial concept was loosely based on Audi’s current A7 hatchback coupe, director Gavin Hood decided he wanted something more progressive. Because the film is set more than 100 years in the future, the goal was to create a vehicle that could reasonably be expected to be powered by something other than a conventional gas engine. This led Rimili — whose design teams are responsible for Audi’s current A4, A5 and A7 lineup — to create what is seen in the film. Yet he was careful not to waste an opportunity to include subtle Audi design cues. Features like the headlights, taillights and single-frame grille remind audiences of the car’s provenance. Audi’s A7 was also used as a real-life stand-in for scenes in which Ford’s character drives the vehicle. Filmmakers then digitally edited the A7 out, and the fleet shuttle quattro in. The film, which premiered Monday night in Hollywood, is based on the book by the same name. Set in 2135, it follows the training of a brilliant military recruit named Ender Wiggen. The young boy has been pegged by Ford’s character as humanity’s last hope in defeating a race of aliens that had nearly wiped out mankind several decades earlier. This is only the latest film credit for Audi cars — real and imaginary. The automaker’s vehicles have shown up on the silver screen in “Iron Man” and “Iron Man 3,” “Wolverine” and “I, Robot,” to name a few. Although the forward-thinking Audi RSQ used in the 2004 “I, Robot” teased what would become the R8 sportscar three years later, Rimili said fans shouldn’t expect the “Ender’s Game” model to hit the streets any time soon.